The ALL-NEW SG-500 has been designed to function as a high-performing arranger keyboard incorporating 476 extraordinary orchestral sounds including a high-quality Stereo Grand Piano. It also has an amazing extensive Style Section (260 styles) covering a broad range – from traditional dance rhythms to modern and contemporary beats and great Latin rhythms. You can use a USB flash drive to record musical data (up to 16-tracks) or play back commercially available Standard MIDI Files (SMF’s). The 88-note Graded Hammer-Action keyboard, the Multi-Layer sampling technology and the new Touch-Sensitivity control system ensure the best control of the piano sound and the absolute authenticity of touch with the quality and the feel of a grand piano. 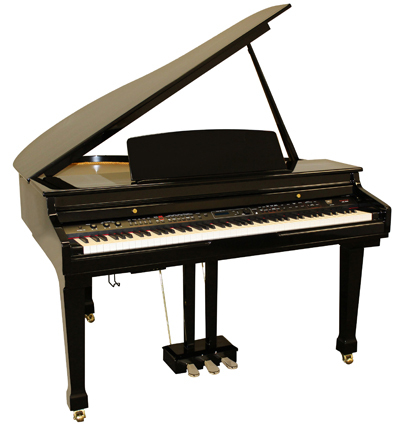 The SG-500 has the sound and performance of a far more expensive ensemble digital ensemble grand piano yet at an amazingly low price. You’d think that with all it offers it would be difficult to operate. Not so! It’s ingeniously designed to be a snap to setup and navigate. All it takes is one button to set up the entire instrument (OTS) to achieve professional sounding results in an instant. SOUND SELECT: GRAND PIANO button, 10 Sound Groups: Piano, Organ, Guitar&Bass, Strings&Vocals, Brass&Woodwinds, Synth&Keys, Accordions, World, Drum&Percussions, Favourites. STYLE SELECT: 11 Style Group: Pop&Rock, Country, Standards, Latin 1, Latin 2, Jazz&Blues, Ballads, Ballroom, Dance, World, Favourites. Rhythm Orchestra: 350 Styles – 2 Variations, Auto Accomp On/Off, Auto Set Up, Tap Tempo , Intro/Ending, Fill 1/2, Synchro & Key Start, Start/Stop, Metronome, Drum Volume, Auto Accomp. Volume, Full Keyboard. Midi: Midi Out: 16 canali, USB Midi In, Local Midi. Copyright © 2017 Samick Music Corporation. All rights reserved.